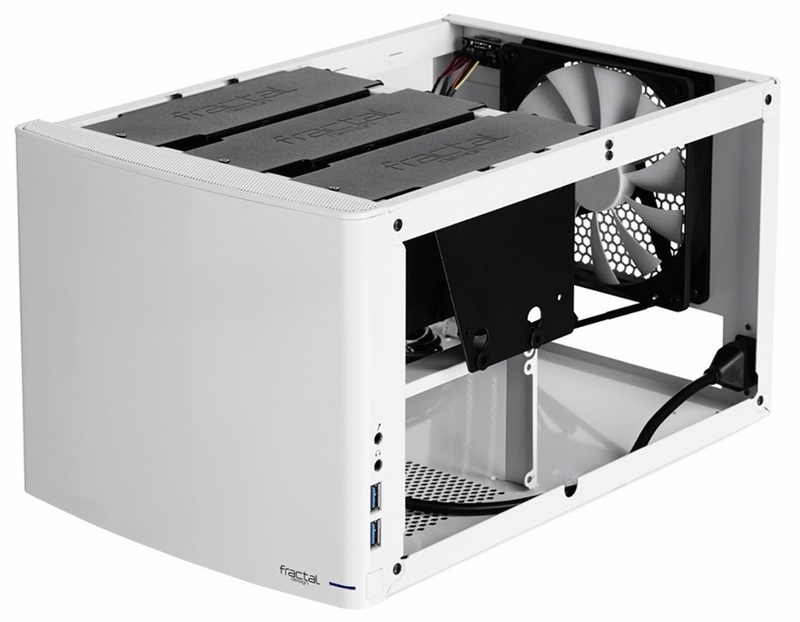 Fractal Design Node 304 White: an unassuming white box about half/third of a normal ATX case. I've recently bought a white Fractal Design Node 304, and on the course of putting it together, I've come across a number of problems. 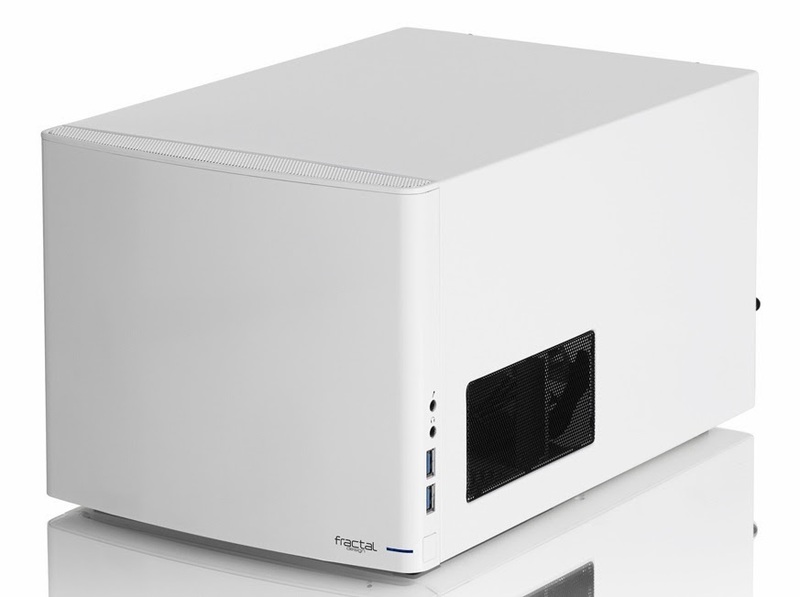 While it is considered to be on the still not really expensive side for a mini-ITX cases, it is still about four times more then the cheapest ATX cases, which also come with a (not very good quality) PSU. I am not saying you should buy those (I say the exact opposite to whoever asks), I'm only saying that for the price, I expected something with far less problems, especially QC problems. I've assembled a fair number of PCs over the past decades, and while I do have a very high quality case (Antec P180b), I've met with my fair share of shoddy cases too. Still, the number and nature of problems presented by the Node 304 were alarming. The case has three fans (1x14cm, 2x9cm) bundled, with a fan controller that can switch between low, medium and high (5,7,12V supplied from a simple molex adapter). As I'm a fan of silent computers, and the PC in question was thermally almost nonexistent for a case of this size, I wanted to use the lowest setting possible. But there is a problem: the 9 cm fans bundled just won't start at 5V. Why would you even bundle fans that don't start at 5V with a fan controller that has a static setting of 5V? The fan controller switch sits almost directly below a thumb screw, which is also a bit uncomfortable. There was only one other case in my entire life where I had to use pliers to get the standoffs in, which cost about the third of what this case does. Screwing them in left flakes of dust and metal around the case, which is really a bad thing in case of electronics. Nice shiny paint to go under the motherboard. It is a shame really. Frankly, every last screw mount is shoddy. Even my other el-cheapo mini-ITX case (costing half of this while including a 75W PSU and having the volume of a big paperback) had far better ones. It is as if the painting got into them and made them way too tight. This causes some flaking when you get the screws out for first time. The case will gladly accommodate double-slot high GPUs, but nothing higher than that. 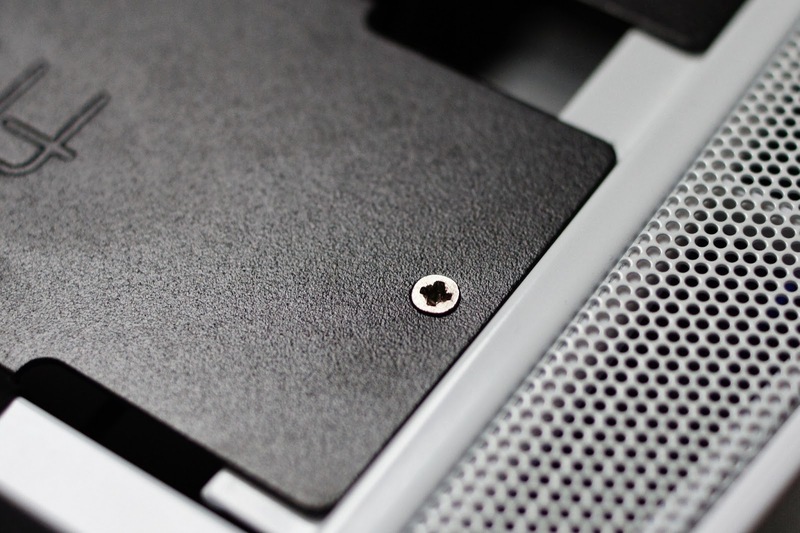 The idea behind thumbscrews is that you don't have to use a tool for them, but unfortunately, this is generally not the case with the ones inside this case, thanks to the problem above. The problem is not limited to thumbscrews. 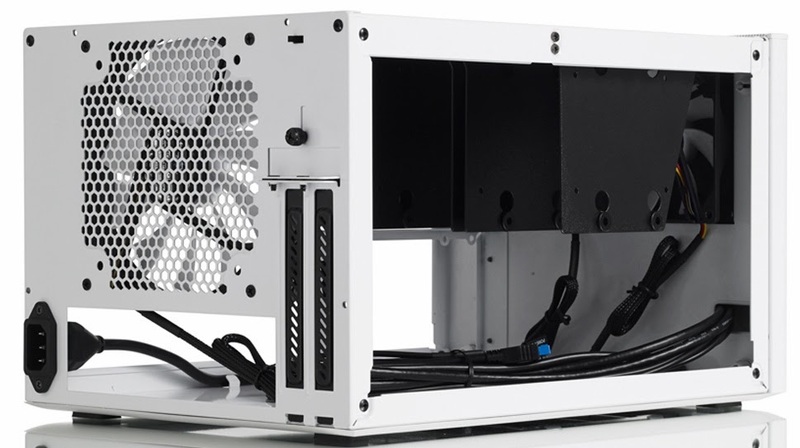 The smaller side-window is for the PSU back exhaust, which is unconventionally placed at the front. It is almost as if the case was pre-owned as the three screws fastening the drive bays were heavily worn when I opened the case. As they were also very tight, I didn't use them afterwards, as there seemed to be a real danger of wearing the heads to the point that I won't be able to remove them. Not the most worn screw heads I've seen, but almost in the same league. The design of this shell could use some re-engineering, as putting it back on is a real bother. It is as if you had to juggle both side panels to place on a regular case, while they are connected. 7: No grommets for 2.5"
Unfortunately, while the 3,5" drives have rubber grommets on their mounts, the 2.5" mounting holes lack these. While I know that most people will turn to 3.5" drives when they need storage and 2.5" for SSD speed, there are also some really great 2.5" mechanical drives that are silent enough (and much better in this regard than regular 3.5" ones) if you use a grommet. 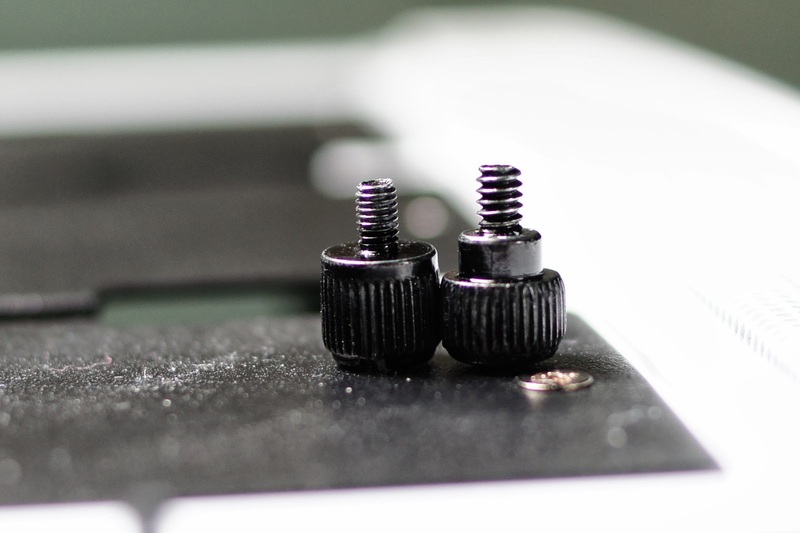 After meeting with the problems above, I almost thought I'd worn the outer shell thumbscrew threads bare on first try, because someone had the great idea of including different threaded, but identically looking thumbscrews in the design. I can't even begin to fathom why would someone think this is a good idea. While the big list above may lead you to think that the Node 304 is a deplorable case that you should only buy for your fiercest enemies, that is not the, well, case. It is true that quality-wise, I found the Node 304 to be lacking unfortunately. At least compared to standard ATX cases that cost half (that were better in many aspects) and double (that despite being a 2007 model still blew it out of the water). But it was a great idea, I grant you that: the thermally almost separated full-length GPU and again separated PSU, the vertical drive bays with place for six 3.5" drives, the big fans and the giant space for a tower cooler are all laudable. I even like how it looks, while I generally go for the black ones. 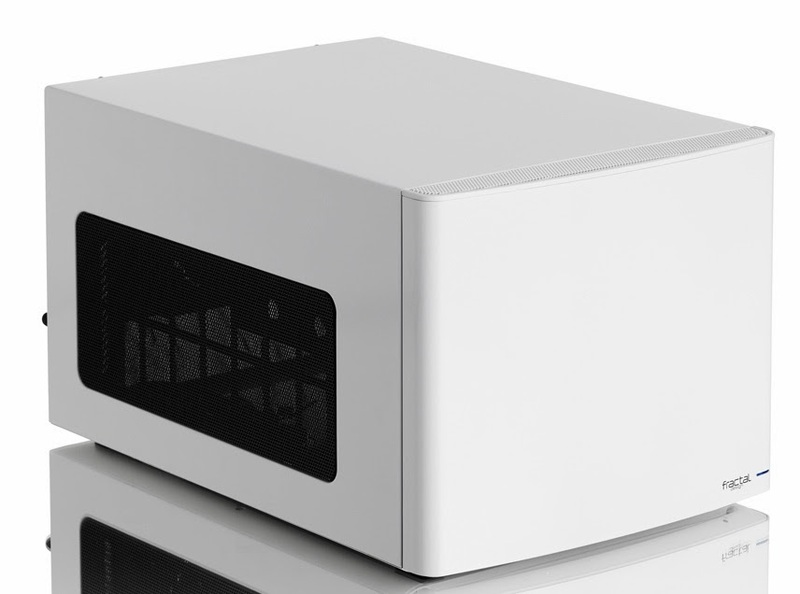 Even if to some, it looks more like a microwave oven than a PC case. And while some reviewers voiced a dislike of the very strong downward-facing white activity led, after one tiny strip of masking tape, I'm actually very pleased with it. It is a somewhat elegant (but a bit too bulky in white to pull that off in spades), nice looking case. I wouldn't say that the Node 304 is a very bad case, but for a mediocre priced, quite well-known brand name case, it falls quite short of being a good one, and mostly on very little things that could be fixed without raising manufacturing costs too much, or in some of the points, at all. It is a shame, as I've heard good things about the bigger ATX cases of Fractal Design.